Blue Sky’s car, the B-7, is parked in the hallway of the Toronto Plaza Hotel during a recent Skule Lunch & Learn event (Photo: Jamie Hunter). Earlier this year, U of T Engineering alumnus Bill Kirkpatrick (Eng Bus 5T3) walked through the Toronto Plaza Hotel, measuring tape in hand, jotting down dimensions of each entryway. The venue, which has hosted a monthly Skule Lunch & Learn for years, has never had an issue getting people through its doors. But at four and a half metres long, nearly two metres wide and 170 kilograms, the “guest of honour” for the latest alumni speaking event posed a special kind of challenge. Members of U of T’s Blue Sky Solar Racing team — and their B-7 solar car — joined U of T Engineering alumni on May 14 for an engaging discussion about the team’s recent accomplishments and the technology behind their sustainable vehicle. Zhe Gong (ECE 1T4), Blue Sky’s managing director, regaled the full room with tales of the B-7’s journey from conception to finished product. In October, the Blue Sky Solar Racing team successfully completed a gruelling 3,021-kilometre trek across the Australian outback at the 2013 Bridgestone World Solar Challenge, recording an impressive eighth-place finish out of 23 teams. 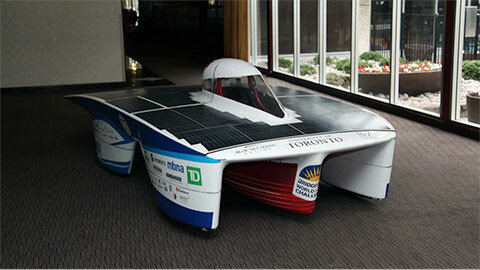 The B-7’s predecessor from U of T, Azure, placed 24th in the 2011 World Solar Challenge. But as Gong emphasized, there’s much more to the success and goals of the B-7 team than finishing a single race. 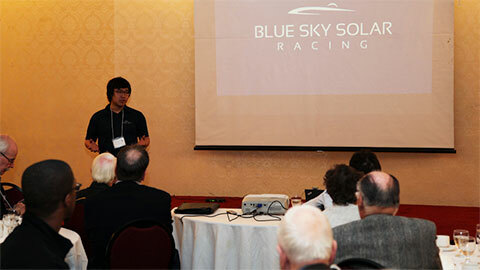 Zhe Gong, Blue Sky’s managing director, speaks to alumni about the team’s triumphs and challenges at the 2013 Bridgestone World Solar Challenge (Photo: Jamie Hunter). Gong is also part of the next Blue Sky Solar Racing team, currently working on mock designs for the new race cycle – with the next race scheduled for 2015. The latest Skule Lunch & Learn event concludes the series for this academic year, and it also marks an increasing shift in demographics for the longstanding alumni gathering. Once geared specifically toward 5T3 alumni, the event is now an opportunity for the U of T Engineering community – including all graduates and an increasing number of students – to share memories while finding out more about U of T Engineering and its impact on the world. 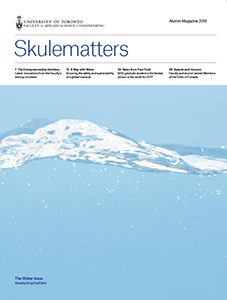 Skule Lunch & Learn begins again in October with a complete schedule of speakers to be announced soon.